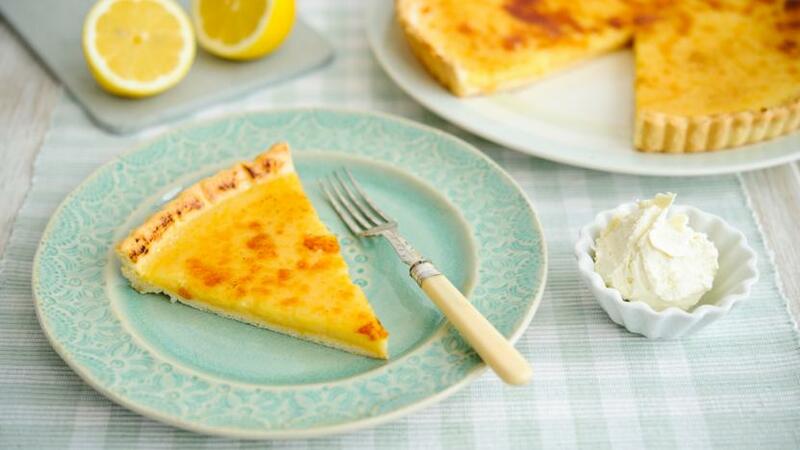 This classic lemon tart recipe is a light, quick and easy dessert - perfect for any occasion. For the lemon tart, crack the eggs into a bowl and whisk gently to break up the yolks. Add the sugar and mix well. Add the cream and the lemon juice and stir. Pass the mixture through a sieve, then add the lemon zest and set aside. Grease a 20cm/8in flan ring with butter. Roll out the pastry on a lightly floured surface to make a circle large enough to fit over the flan ring. Using the rolling pin, carefully lift the pastry over the ring and gently press into the ring. Allow the pastry to overhang the edges of the ring slightly. Line with a circle of greaseproof paper and fill with rice or baking beans. Transfer to the oven and bake for about 15 minutes. Remove from the oven and remove the beans and greaseproof paper, then return to the oven for five minutes, or until the tart case is lightly browned. Turn the oven down to 150C/300F/Gas 2 and pour the lemon mixture into the tart case. Bake in the oven for about an hour, or until the filling is just set and the pastry is golden-brown. Remove the tart from the oven and trim off the edges of the pastry. Leave to cool completely, then place in the fridge to chill for about two hours. Dust the top of the tart generously with icing sugar then place under the grill until caramelised. For the goats' cheese cream, place the goats' cheese into a bowl with the cream and icing sugar and mix well. To serve, cut the tart into wedges and serve with a spoonful of the goats' cheese cream.